reposted from I Am A Reader, Not A Writer. Click to see full article and giveaway. Or better still, other people laughing by themselves, for no apparent reason. Probably thinking back to something funny. It happened to me this morning when I was out dog walking. Some girl was heading down the path as I was heading up. Just ten yards from me she suddenly stifled a giggle. I checked my clothes, face etc. when I arrived home. I don’t think it was me she was giggling at, but even if it was, it made smile. So that’s OK in my book. Especially when I’ve been scouring the house for some. I know it’s bad for me, makes me overweight, terrible for skin, etc. etc. But when you get that craving… I’ve taken cupboards apart, searched through drawers and texted people late at night begging them to bring some over if I’ve been unable to get out. I’m a sucker for them. All that reuniting of friends, long lost sisters and brothers, mothers, fathers. Those programmes partly inspired our second novel, When Good Friends Go Bad, about three women searching for their missing school friend. After I smile though, I usually end up blubbing my eyes out. I don’t care that they’re made to wrench at heart strings, my heart strings are still well and truly wrenched. She does stupid things all the time that make me smile. I walk in and see her wagging her tail in greeting and it makes me smile. How can it not? She rushes to fetch her “tugger” and nudges it at me so I can play tug of war, and it makes me smile. I mention my friend’s name (who often accompanies me on dog walks) and immediately she races for the window, leaps onto the sofa and peers out the window to see if she can spot her car. Whenever I’m down or worried about stupid irrational things, I only have to look at her and I smile. How could I not include them? Especially when they’ve been away. With five of us and the dog in the house, it’s sometimes crowded and usually messy. And I often crave solitude (to write – not to clean I might add). This year I didn’t join them on their marathon annual bike ride in freezing weather around France in April (wonder why?). Instead I went with friends to visit Hungary. It was a fantastic experience but I did miss them. And I did smile when they returned. He chats to everyone, just like my mother used to, sometimes it’s great and sometimes embarrassing. I sat behind him on a plane recently because we couldn’t get seated together and had to laugh as I heard him engage the women on either side in non-stop conversation, telling them jokes, finding out their life history. Of course then he asked if they’d read this new brilliant novel, Looking For La La, and raved about it while I cringed. (Need I add, he hasn’t read it yet.) I was dreading him pointing back at me and saying ‘there’s the author”. 7. My beautiful horses: Sylvarr, Sugar and Luna. I made a 20’ wide exercise track around my pasture and I love to watch them galloping around it, bucking and playing, three white Arabians with flowing manes, tails up and waving like flags. There is no prettier sight in the world. He’s a woodle – part wheaten terrier, part poodle, even the name is comical. He’s like a rasta muppet. I love the way he runs full speed to his bed and collapses instantly into sleep, upside down, paws in the air, legs wide apart. If you give him something good – a tennis ball or a nice juicy bone – he’ll rush upstairs and bury it in our bed. I once noticed a dead vole (something like a mole or rat) that Remy had dug up lying on top of the duvet next to a blissfully unaware Gary. Threw it out. Next night Gary slid his hand under the pillows and encountered another, also dead. Two days later his feet touched something cold and furry. Yep, another corpse. Our boy was so proud of his hunting skills. She’s part Manx, tail-less, was supposed to be a barn cat but when she got spayed I had to keep her indoors and she won Gary’s heart – and he’s not even a cat lover. Funnily enough she’ll sleep in the dog bed in the same inelegant upside down, legs splayed position as the dog. She loves to attack our feet when we’re in bed, pounding on anything that moves under the covers. And when I let Sylvarr graze dragging a long lead rope, she’ll attack that too – this tiny cat using all her might to hold back an oblivious 1,000 lb horse. Last but not least…my friends always make me smile and I include my family – sisters, nieces and nephews – among the laugh-makers. I am lucky that we all share the same sense of fun and aren’t afraid to be silly, whether it’s dressing up for Halloween or a murder mystery dinner, dancing on top of the houseboat at Lake Powell dressed in evening gowns and feather boas (or sarongs and home-made masks), throwing down chips at a Las Vegas craps table, or holding an impromptu party for twenty of our nearest and dearest with about 30 minutes notice. There is nothing like seeing a friend walk in with a bottle of wine to put a smile on my face. Or even if they show up without one. via Looking for La La by Ellie Campbell – Tens List & Giveaway. Once Upon A Time — An eclectic book blog with a particular love for fantasy, paranormal and chick lit. Right before I decided to stop accepting guest content, I had a lovely application for a fun feature from the Campbell sisters which I was more than happy to accept as my final piece of guest content for a while. Looking For La-La sounds like such a fun and slightly whacky chick lit with a mystery and a hunk of humour. Here is Lorraine to tell you a little about the inspiration for Looking For La-La. Malicious Joke or Unexpected Inspiration? We’ll always deny it. No one wants to lose their friends or stop the gossip flow but all writers are thieves. Call us literary kleptomaniacs – we can’t walk into a room without wondering what we can steal. Perhaps our latest hero should have that violin case carelessly slung in the corner and his aunt possess the Lalique vase and that interesting mannerism of repeating everything twice? With luck, the victims will never know they’ve been robbed and the critics will rave about keen observational skills. But sometimes it’s not so subtle. But occasionally life hands you an unintended gift that’s too good NOT to use. Like the postcards which arrived at the door of my sister and writer-partner, Pam Burks, proclaiming love for Pam’s husband and implying they were having an affair. (OK, perhaps only a writer would see that as a blessing). Fast-forward a few years and here’s the opening to Looking For La La, our latest Ellie Campbell novel. “Not a sound is heard as it lands silently on the mat. No drums rolls, crashing thunder, shafts of light. The walls don’t start crumbling, the ground doesn’t vibrate with terrifying tremors and a yawning fissure fails to zigzag across the kitchen floor and separate my husband from his breakfast marmalade. So, OK, yes, we’re busted. This time we did borrow directly from real life. But as neither Pam nor I know the identity of the mysterious La La, we don’t feel all that guilty. Besides it’s a safe bet that her motives in sending the cards were probably not to promote marital bliss. Luckily Pam knows her husband too well to ever believe they were anything but a bad or malicious joke. But we had a lot of fun imagining how events might have transpired if our heroine Cathy was just a little more crazed, if someone were truly lusting after Declan, and if there were a person who wished Cathy ill – perhaps even a murderer – lurking in the neighborhood. Beyond that opening, however, you can rest assured everything came from the bottomless depths of our unbounded imaginations. Except the Lalique vase. And the hero’s violin case. Looking For La La by Ellie Campbell is available from Amazon for Kindle or Print. via Once Upon A Time — An eclectic book blog with a particular love for fantasy, paranormal and chick lit. Again, you can see the whole thing on Hannah’s blog. Where, I have to say, it looks a lot better than on this one. 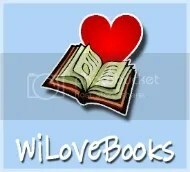 And don’t forget to enter our Book Giveaway through the link on the top right side of this page.